Vehicle tracking devices give you the ability to monitor driver behavior and find opportunities to improve fleet efficiency. Every detail of the day is accounted for using automated reports, mobile apps and real-time alerts. You have instant access to track current location, stops, speeding, idle time and unnecessary use. With real-time information and accurate records of driver behavior and vehicle activity, it’s easy to keep mobile workers completely accountable. We provide an industry leading 10-second update, real-time alerts, and automated reports that give you the tools to better manage employees and assets in the field. 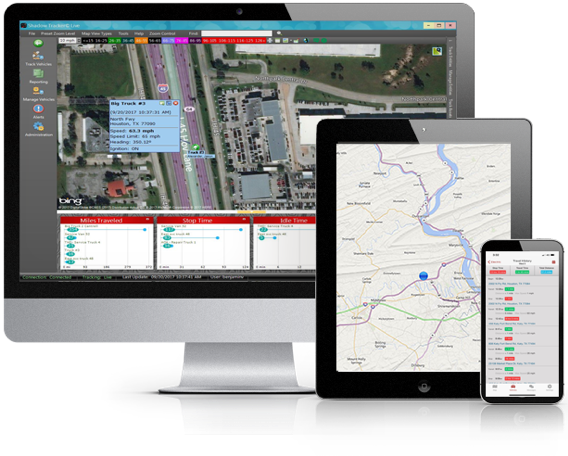 With real-time location fleet managers can easily make adjustments to run more efficiently and use alerts to correct speeding, excessive idling and misuse. Reducing these unnecessary, costly or risky behavior helps reduce fleet expenses and increases your driver’s safety. We can even provide digital timesheets for accurate accounts of hours along with location to reduce “padded” sheets or inaccurate records. GPS tracking isn’t just for truck fleets, it also gives business owners visibility to their mobile assets, including trailers, heavy equipment, bulk containers and more. When you can’t have someone on site to monitor your assets, our GPS software provides location information for enhanced security and accuracy. Our GPS tracking solutions help thousands of companies across North America reduce fleet costs and manage mobile assets more efficiently. Customize user access to set which vehicles and the level of information they can see. You can create branch locations, and subgroups within the fleet to quickly identify: Managers, Service Techs, or any designation your fleet needs.